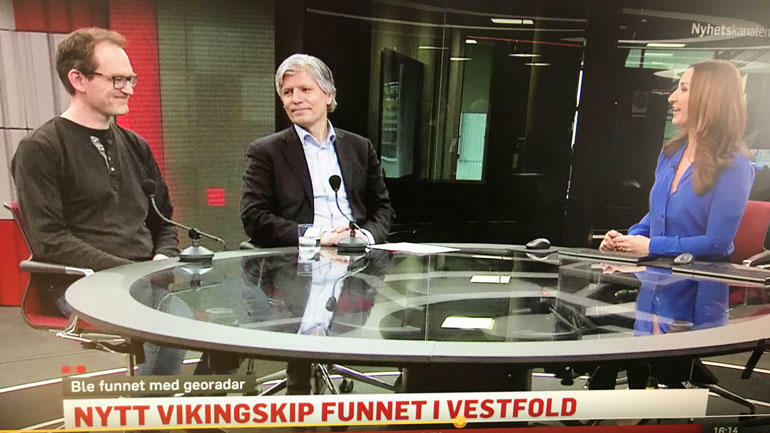 Professor Bjørn Bandlien says the discovery of a new Viking Ship in Borreparken, Vestfold points towards the area being one of the main centres of power in Viking Age Scandinavia. – It must have been completely unique, says professor Bjørn Bandlien who is an expert on the Viking Age and Viking Ships. He teaches Viking Age for USN's students in history on campus Vestfold. The campus is only a few hundred meters from Borreparken, and the area is actively used in teaching. In the autumn, a completely new topic starts in "Viking History and Old Norse Literature", where Bandlien is sure to tell about the significance of the new discovery. VIDEO: Join Bjørn Bandlien around Borreparken. The video was created before the last discovery in Borre. - The Borre chiefains must have had control over people and income from a large area. There must have been a large number of slaves involved in the construction projects and on the land. There must have been extensive trade in goods, and these goods may have come from the north and from Denmark and Europe, says Bandlien. He believes the burial ground indicates that those who reigned at Borre must have been rich and powerful. - It must have taken several years just to make the sail on such a ship. The next generation had to be rich. They must have been able to let go of a substantial ammount of valuables to provide for such a magnificent funeral, says Bandlien, who has his office a few minutes drive from the find.